Editor’s note: You may have missed this article when CMI published it last year. We’re sharing it now because improving your keyword efforts is always top of mind for content marketers. SEO does not always work the way we want. It is common for Google to rank a page for keywords other than the ones for which we would like the particular page to rank. What can you do? 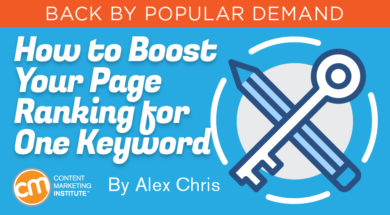 How can you guide Google to improve the ranking of a page for the keywords you want? The simple answer is that you need to make sure that Google “receives” the right signals from your page to optimize it, but this is not always easy. A thin line separates optimization and over-optimization. Optimization is good, as it will increase the page’s rankings, while over-optimization is bad, as it can generate exactly the opposite results. Let’s see how you can optimize a page for a keyword and improve its rankings in an efficient way by avoiding over-optimization mistakes. Before doing anything else, find out where your page ranks today for the keywords you want to improve. Without a baseline, you will not be able to measure progress. You can do it manually (i.e., search for your keyword in Google and take note of your position) or use a rank-tracking tool that can do this daily automatically. Caveat: Don’t expect to magically go from position 40 to position 10. Improvement comes gradually, but you need to know your starting point. Type your target keyword in the Google keyword tool. You are looking for two things. First, find variations of your target keyword, especially long-tail keywords. Second, look at the competition for each of those keywords. You will use this data later. Are your expectations realistic? If your target keyword has high traffic, it also has a lot of competition. Can you compete with those websites? Take a closer look at the first 10 results. Are all results from high-authority websites? Is Google ranking a domain (i.e., the home page of a website) or a single page for the particular keyword? Click the links and open the first five pages. Is that content better than yours in both quantity and quality? Examine each website more carefully. Are they “big” websites with lots of pages? Are they blogs? Are they corporate websites? Try to gather as much information as possible. Why go to all this trouble? For one simple reason: Although in life nothing is impossible, in SEO not all things are possible. I am sorry to be the bearer of bad news, but sometimes we don’t rank for what we want but instead for what is realistic. The good news is that there is a way out, and let me explain. 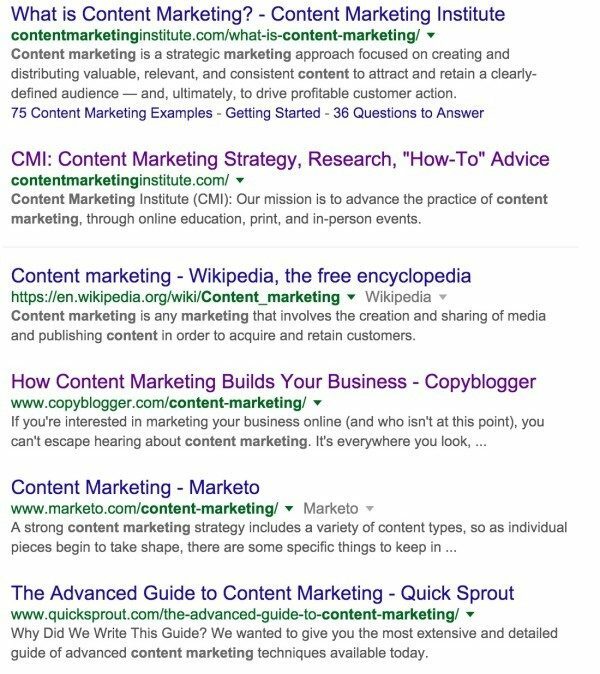 I would love to optimize my website to rank for “content marketing” but this is impossible. Take a look at the Google results for this keyword. Unless my website can compete with the Content Marketing Institute, Wikipedia, Copyblogger, Quick Sprout, and the other high-authority websites, nothing I do will get me to the first positions. I can get a place on the second or third pages but that’s as far as I can go. Should I give up and quit? Of course not. This is where the long-tail keywords and proper page optimization come to the rescue. Go through the list of long-tail keywords you gathered and find keywords with significant volume but not such strong competitors. Some may argue that the traffic gained from the long-tail keywords does not compare to that of the main keywords. This is true, but it’s a more realistic approach for keyword success. You don’t want to spend your efforts pursuing rankings you cannot achieve but rather focus on identifying keywords that can realistically improve your page’s results. Don’t forget that high rankings for long-tail keywords build trust that gradually can result in better rankings for more competitive keywords. Now that you have set realistic expectations, you can start doing some real work. Page titles: Include your target keyword (or variations) but don’t do keyword stuffing. Mentioning your keyword in a natural way in the title is enough. Google’s RankBrain machine-learning technology is clever enough to associate different keywords and find relevant results, but you still should make sure that your keyword is in the title. Example: Have a look at a nice example from Google. Page descriptions: Google may choose not to show your description on the SERPs, but it is still important to provide a custom description for each and every page of your website, especially the pages you want to rank higher. Accurately describe the page content and include variations of your target keyword. Look at the AdSense example above and see how nicely Google adds variations of its target keyword into the description (e.g., learn how to make money online, content monetization, make money). H1 tags: Review your HTML code (open the page, go to “View Source” and search for H1). Check that your page has only one set of H1 tags. The H1 tag is not necessarily the same as your page title tag, but it should contain variations of your target keyword. Page content: Back in 2011, Amit Singhal (former head of Google’s ranking team) published an explanation of what Google considers to be a high-quality website. It’s one of the most important documents when it comes to SEO because it describes what Google is looking for when assessing a page’s value. Things like content quality, originality, formatting, in-depth analysis, presentation, and author trust play an important role. Assuming that you got all those behind-the-scenes tips correct from the beginning, you need to ensure that your target keyword (and variations) is mentioned in the content of the page. I am not suggesting that you stuff the keywords in the text or over-optimize, but you need to check that the crawler in the page title and H1 tags are consistent with the page’s content. Some tools can calculate the keyword density and make recommendations, but you don’t have to go that far; mentioning your keywords a couple of times in your content is enough. Structured data: Microdata, rich snippets, schemas are all names related to structured data. Although this is not yet part of Google’s ranking algorithm, it is trending and sooner or later will be part of the ranking process. By implementing structured data, you make it easier for Google (and other crawlers) to understand what your page is about, improving your chances of ranking higher. 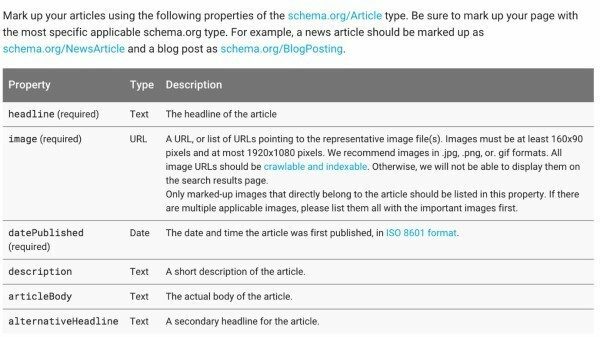 Structured data is not only available for products or organizations, but it can also be used for articles and blog posts. When you’re trying to improve the ranking position of a page, the rest of your site can help a lot: Use variations of your target keyword as anchor text on your other pages and link them to your targeted page. Internal linking is great for SEO. Among other things, it can help Google identify the site’s important pages and their meaning, as the pages with the most internal links generally are the site’s important pages. Among other things, it mentions: “In either of these cases, the better your anchor text is, the easier it is for Google to understand what the page you’re linking to is about.” I know this is outdated information when it comes to external links, but it is still valid for internal links. Besides internal links, another measure is to make sure that related content is published on your website. What I mean by this is that you should create pages that target other related keywords. Following the earlier example, the Content Marketing Institute ranks for “content marketing”: not only because the home page is optimized for that term but because a lot of the published pages are closely related to that term, which makes the home page ranking stronger. While you should optimize pages on the site with relevant content for the page you want to rank higher, don’t think of just text. Use other types of content (infographics, videos, slideshows, etc.) and take into account the latest blogging trends, especially those related to publishing frequency. So far, all the actions are about changes you can make on your website, but don’t forget about the role of other off-page SEO signals. Depending on how competitive your keyword is, you may have to carefully build a couple of external links to your page. 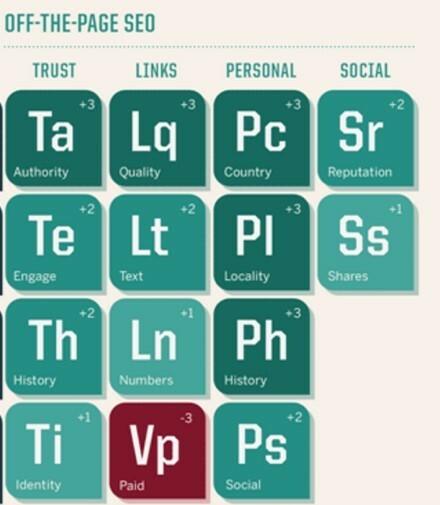 Identify highly relevant and trusted websites to incorporate your links. 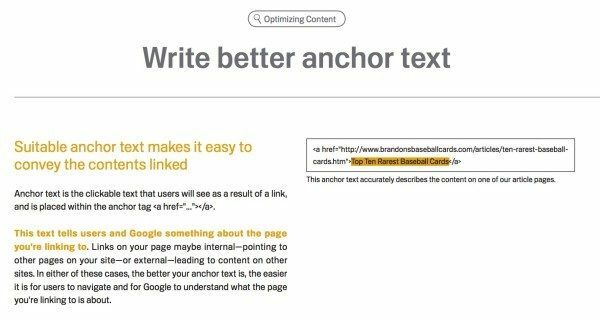 It does not need to be optimized because, unlike internal links, external links don’t use keyword-rich anchor text. Your goal is not to confuse Google and make it believe that you are trying to trick the system by artificially building links, but to have it recognize that you are adding value to the other site’s content. Another way to make that page known to other users and dramatically increase your chances of getting natural links is to promote it in social media networks. Spend $20 on Facebook to boost your page, use Twitter’s promoted tweets, or Pinterest’s promoted pins to make the page visible to more people. The bottom line is that you must use any valid technique or means to get your content in front of as many eyes as possible that would be interested in referencing your content from their blog or website. Remember that your goal is not to get more sales or visits to the page but to improve its ranking. Advanced SEO tasks, like trying to improve the ranking of a page for a specific keyword, take time. It takes time for Google to notice any changes on a published page, so don’t rush to conclusions too quickly. Optimize your page titles, descriptions, and content for the target keyword. Work on your off-page SEO. What is important is to have progress and slow improvements with your rankings rather than doing over-optimization, gaining temporary high rankings, and then wondering how to get out of Google penalties. Stay on top of both the changing and the consistent techniques for SEO and much more. Subscribe to the Content Marketing Institute blog for daily or weekly insight. Alex is the Digital Marketing Manager at Reliablesoft. He is working online since 2002 and has helped many companies improve their online presence. You can read more of his articles at Digital Marketing Pro and also connect with him on Twitter @reliablesoftnet and Google+.